The first international Alkema composition contest calls for scores for piano and saxophone, deadline April 2012, in honor of the late Dutch composer Henk Alkema. While researching for my forthcoming paper on “call for scores” I came across an announcement in English and in Dutch, calling for scores for saxophone and piano, deadline April 2012. I recognize Alkema, the last name of my late composition teacher Henk Alkema. I see the announcement is made by Matching Arts and Utrecht Conservatory. I recognize the name of one of the jurors, Jeroen D’Hoe who had also taught me composition at Utrecht Conservatory. Once upon a time, a Chinese classical saxophonist from Szechuan (Sichuan) had shown me different effects of the alto saxophone to interest me in composing a modern piece for him. I did not write a solo work for saxophone. Instead I included the four kinds of saxophones in an ensemble piece as part of a composer-in-residence project. That’s when I learned of the saxophone’s range and versatility. Saxophones could sound like flute, clarinet, or French horn. In my last conversations with Henk Alkema, he had urged me to start composing again. I see he has not given up. The contest is open to composers of all ages and nationalities. I am glad to see that. During my four years at conservatory, I found that most competitions posted on our bulletin board had imposed age restrictions. I did not know then to look online. This contest has been announced in many composition forums and newsletters. I will for sure follow the results of this competition in 2012. To composers: Call for scores for multi-hand piano duets (many hands on one piano) for a sight-reading competition in San Francisco deadline 5 April 2011. 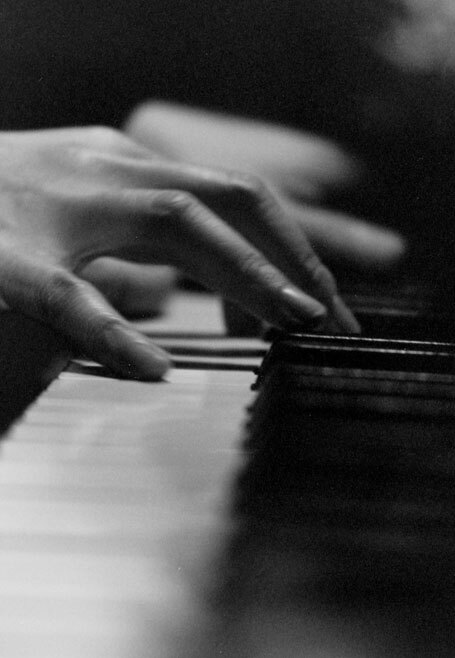 On Sunday 15th May 2011 at probably the first sightreading competition of its kind, pianists will attempt to read and play multi-hand piano duet music that they have not seen and played before. The location: a loft apartment in San Francisco with a Steinway grand piano. What is a multi-hand piano duet? The simplest is two hands. Next is 3 hands. The popular one is 2 pianists on one piano. The challenge is to write music for more than two pianists. repeatability: i.e. the pianists want to play it again or share it with others. There should be an element of fun, intrigue, challenge, or something that prevents one from dismissing it and putting it away on the shelf to be forgotten. For an indication of the difficulty level, please visit a piano soiree that was held in the same place previously. This is a piano club that gets together regularly to have fun. We want to introduce music for several pianists to play together. Sight-reading levels of pianists are usually always lower than performance levels, i.e. the difficulty should be lower than the solo performance repertoire. Please use the following LEAVE A REPLY form to express your intention to submit. You will get a reply with an e-mail address to submit your score to. Your comment will not be published. I was first introduced to multi-hand piano duets at my Steinway Welcome Party in Bussum, Netherlands. There were many pianists and two pianos. 4 pianists on 2 pianos. 3 pianists on one piano. One can imagine the possibilities. Please include a description of the piece, such as what inspired you, techniques and challenges, or anything unique about the piece. Provide a link to your website or biography. This blog will get updated and refined over time as questions arise.